Pittsburgh Corning is making home improvement look easy with their easy to install ProVantage® spacer system. With flexible glass block designs for walls, windows, partitions and showers, a homeowner’s weekend project is limited only by their imagination. “It’s easy to add the classic look of glass block to your home with our do-it-yourself glass block spacer system,” says Mary Lynn Bruce, Marketing Manager for Pittsburgh Corning. Pittsburgh Corning Corporation, a leader in the glass block industry for over 75 years, is showcasing the installation ease of their ProVantage Spacer system for Do-It-Yourself (DIY) homeowners looking to add value to their home with timeless, classically designed glass blocks. With flexible glass block designs for walls, windows, partitions and showers, a homeowner’s weekend project is limited only by their imagination. Pittsburgh Corning leads the DIY homeowner through the project step-by-step guide from conception to finish with their weekend DIY project modules and project planner. 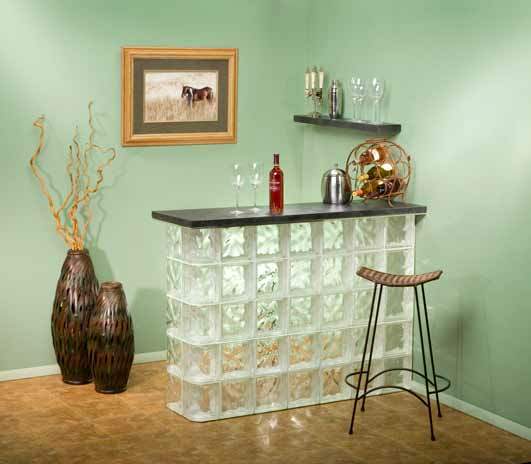 Glass block projects know no bounds when it comes to their versatile home improvement options. In interior applications, glass block can create windows, partition walls, showers and more, while allowing light to carry between living spaces in a decorative way. In exterior application, glass block lets natural light into the home without compromising privacy or security.